Here's my new summer living room with the shiny new things finally installed! The piano (below) is on the left, and the computer (close-up below as well) is in the corner, a little dark. Sofa on the left and media centre on the right with the dysfunctional tape and MD players. Usually the shoji are at the other end of the window to keep the computer corner cool. 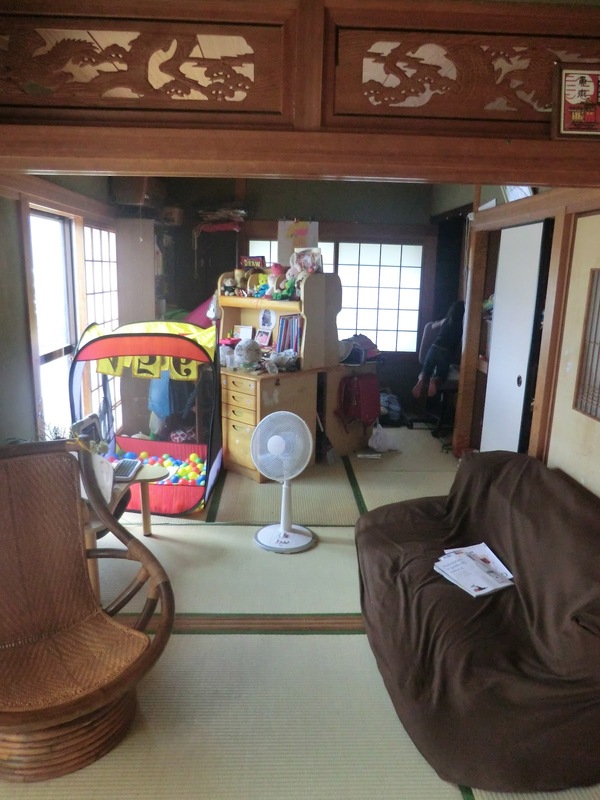 The wicker chair sits in the cross breeze between the front and back doors, plus with fans from the other two directions it's the coolest spot in the house - I thought until today when I figured out the genkan was. I am seriously considering moving my wicker chair out there for my afternoon tea! What a bloody granny. From the other direction.... a bit more cluttered, with Erica's tent and Amy and Lena's desks. But better than it is right now - but it's still not bad enough yet to take a true 'after' shot so you'll have to wait for that. I will happen! Gratuitous cute shot. Erica on 'Grandma's' wicker chair. It rocks! I mean, literally, not as in 'it's cool'. Though it is cool, if you mean temperature-wise.